A correspondent for Outside recovers a remarkable piece of history: the story of America’s first colony on the continent’s West coast. Beginning in 1810, John Jacob Astor (1763–1848) set in motion an audacious plan to create “the largest commercial enterprise the world has ever known.” He planned to control North America’s entire fur trade by establishing a trading post at the mouth of the Columbia River, the lynchpin of a network extending west to the Pacific Rim and east to Europe. President Thomas Jefferson encouraged the venture, envisioning Astor’s proposed settlement as the beginning of a “sister democracy” to the United States. From his base in Manhattan, Astor launched a two-pronged expedition: an Overland Party that carved a path later known as the Oregon Trail and a Sea-Going Party that sailed around Cape Horn to the coastal region west of the Rockies. Stark (The Last Empty Places: A Past and Present Journey through the Blank Spots on the American Map, 2010, etc.) spins the tale of these arduous journeys, the founding of Astoria and the outpost’s abandonment during the War of 1812. He focuses on the tyrannical sea captain, the beleaguered, consensus-seeking businessman, and the shady, self-important fur trader who headed the parties and the French voyageurs, Yankee seamen, and Scottish woodsmen they commanded, as well as the Native American tribes they encountered. If the character of Astor remains indistinct, not so the horrors faced by the Astorians. Their various ordeals give Stark the chance to comment on cold water immersion and hypothermia, the efficacy of pounded, dried wild cherries in combating scurvy, and the intriguing role of what we would today call PTSD in the early exploration of North America. 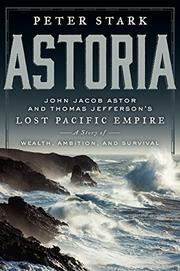 Near the end of his life, Astor employed Washington Irving to tell the astonishing story of Astoria. With Stark, this almost unbelievable tale remains in expert hands. A fast-paced, riveting account of exploration and settlement, suffering and survival, treachery and death.